If you were to go to sleep in the town of Springwood, you may have someone jump into your dreams...and not in a good way. That someone, of course, is horror icon Freddy Krueger. Now, Freddy here has a twisted love of taking the dreams of children and teens and turning them into freakish and frightening nightmares, killing them from the inside. 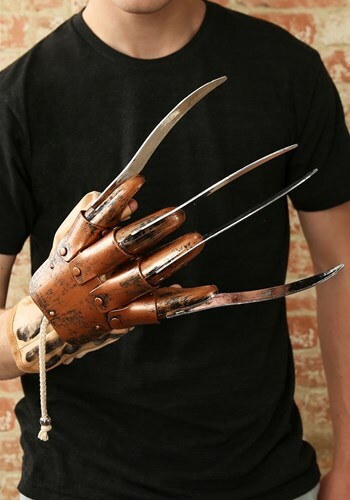 Now, we’re not advocating that you pick up any of Freddy’s hobbies or past times, but you can look just like the dream demon himself this Halloween with this great Freddy Krueger Glove accessory. Paired with a striped sweater and a burned face mask, it is sure to make all of your costume nightmares come true. While most days you may avoid strolling down your neighborhood's own Elm Street, that may prove the perfect place to trick-or-treat in this demonic glove!